Kim Yoon-ju (김윤주) was transitioning from a working holiday to a student visa in Perth when she ran into Jo Hyeon-tae (조현태). Two baristas, both alike in dignity, both passionate about learning the craft at their respective home cafes. It’s a star-crossed love story that ends happily. 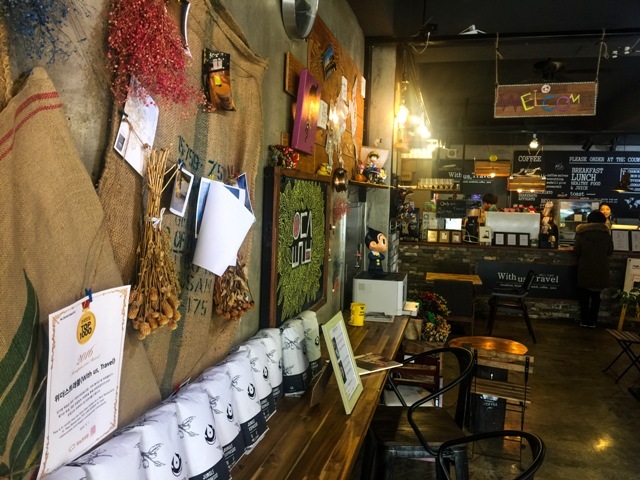 Their coffee connection not only brewed one of Jeju’s hottest cafes, it also percolated with the delicate aroma of love (they plan on getting married in September of this year). Upon their return from Down Under, Hyeon-tae and Yoon-ju came up with a business plan, along with her cousin Bong Pil-hyeon (봉필현) who had also been studying the mystical arts of the brown bean in Australia. There would be coffee, of course. However, Yoon-ju wanted to bring her love of brunch to the table as well. This had been one of her favorite discoveries during her travels abroad, and she wanted to introduce it to her hometown. She couldn’t have been more prescient. Jeju is in the middle of a major brunch migration. 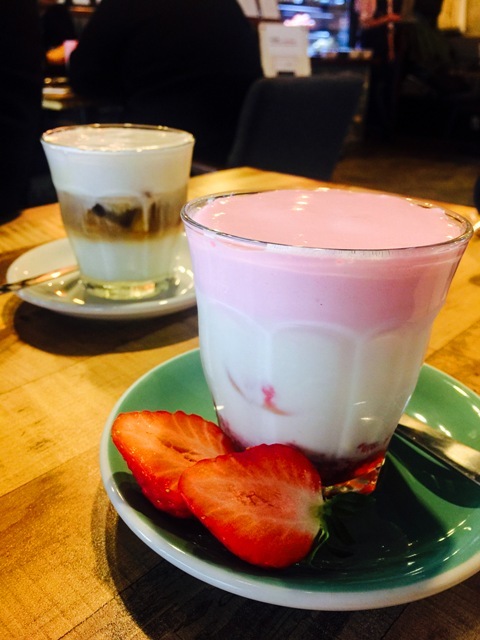 You can now explore a dozen different interpretations of this interstice between breakfast and lunch, with additions being made to the list of places offering brunch on an almost weekly basis. And sure, some of these attempts at brunch are plain, but some - like at With Us Travel - are just plain fun. Yoon-ju, Pil-hyeon, and Hyeon-tae are enjoying themselves, and it shows. 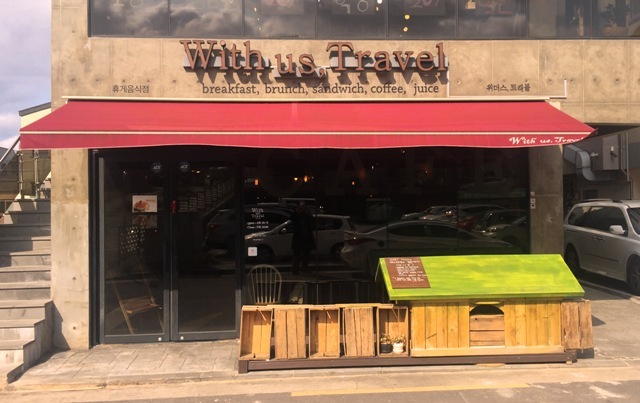 Not only in the style of their cafe and the camaraderie of the staff (they close shop on holidays and all go travelling together, hence the name) but also in the imagination of their menu. 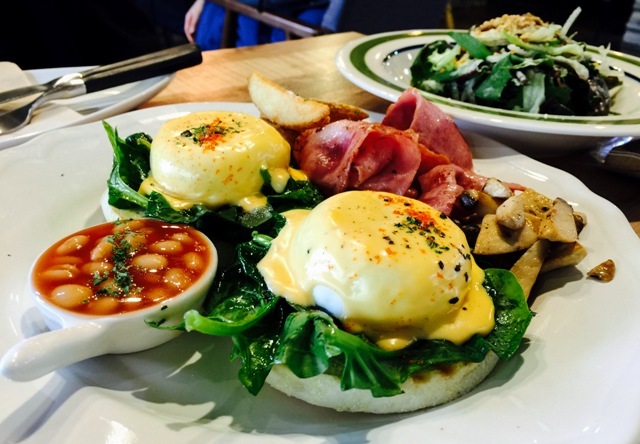 I’m happy to report that eggs benedict is finally establishing a beachhead here on Jeju, and the With Us edition reclines on a luxurious English muffin covered in spinach, slathered with hollandaise. 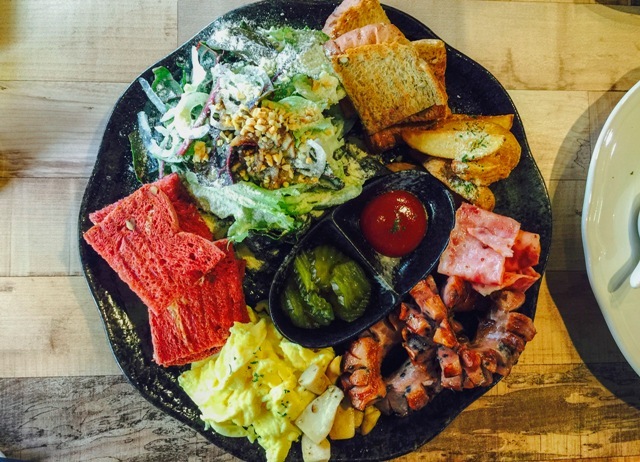 Their main brunch set is a massive plate overflowing with two types of meat, two types of toast, eggs, thick cut french fries, sautéed mushrooms, and a generous salad. The bacon was especially robust, and the colorful “fermented red rice” bread compelled me to eat it with disgusting abandon (sorry). I suggest getting both of these mains together, at 13,000 won apiece per set with coffee. Oh yes, and the coffee here is magnificent. The basic black is solid, but the specialties of the house are homemade masterpieces crafted by Pil-hyeon. Seriously, just shut up and get his invention called “The Himalaya”. This three layered coffee is a magnificent combination of hot and cold, bitter and sweet. I’ve never seen or tasted anything quite like it before, which is an accomplishment in a field as saturated as the boutique coffee business is in Korea. 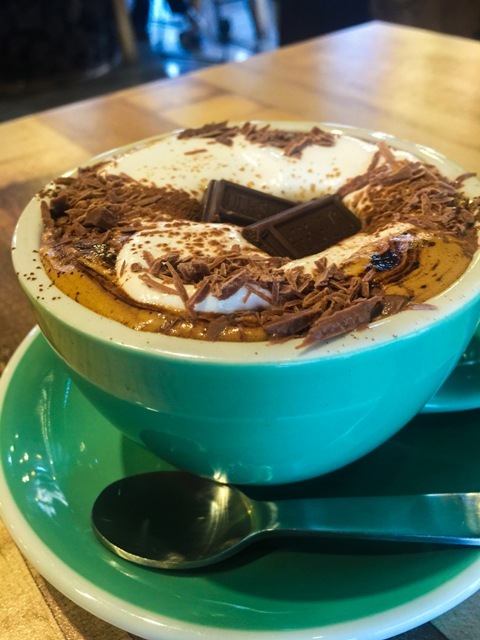 And the hot chocolate was also an innovative slap to the pleasure centers of my brain, with no fewer than three kinds of chocolate all crowded into a single, large, bright blue cup. It almost certainly gave me the most welcomed case of diabetes I’ve ever had. 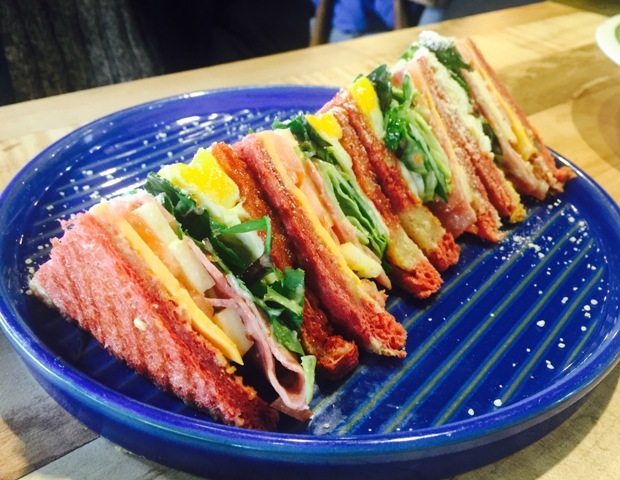 Other items include sandwiches and panini, which are well worth the 8,000 won per set (6.5 alone), however it’s the Belgian waffles that really steal the show. There are six kinds of colorful, drizzled, dripping insanity on the menu. 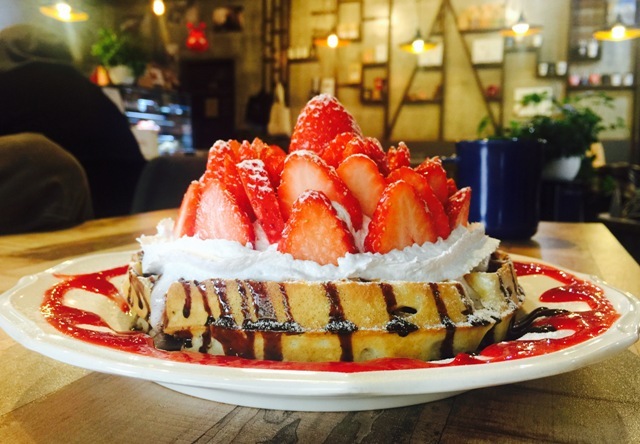 Waffles run between 9 and 15,000 won each. You’ll be gratified to learn that they all demonstrated a complete disregard for human life, each a rampage of enough sugar and fat to choke a full grown yak. You can get all sorts of festive toppings, but the strawberry waffle with vanilla ice cream and whipped cream was the true king of the jungle. I have no idea how they are making money with this since they loaded the beast with at least a dozen fresh, ripe, gigundous strawberries. It will only take one visit for you to see why their seating for about 30 is pretty consistently full up, not to mention why they’re opening a second location in the Tapdong area in March. With Us Travel is a hotbed of enthusiastic, charming weight gain. I’ll go here again. I’ll gain weight, again, and I’ll love it.